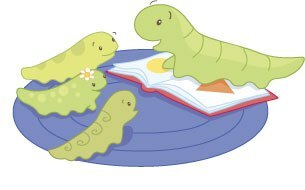 The Itty Bitty Bookworm is a literature based curriculum for children as young as 18 months up to 5 years old. The curriculum comes on CD for the Bo and Baily Curriculum. The Bo Curriculum is geared toward ages 3-5 years old and the Baily is geared toward children ages 18-36 months old. As a Charlotte Mason inspired home school, a literature based curriculum appealed for such little ones appealed to me. I believe children should be surrounded by solid books to enhance and encourage education. Itty Bitty Bookworm fit in with this line of thought. The curriculum uses excellent books while using many books you most likely have for your child. List of suggested items to enhance the curriculum. Graphic organizer for the teacher to take notes on student progress. Overview of the year in advance. Monthly objectives to keep you on track. Coloring pages, printable poems, activities, and crafts. Complete schedule and list of activities perfect for group settings as well as homeschooling. I have one child using Bo and one using the Bailey Curriculum. Each child is having so much fun exploring literature and doing the activities. I was surprised how much my 19 month old is learning! Bo and Bailey use many of the same book so that makes it easy and fun for all of us to enjoy reading time together. This is a very well laid out program that shows the years of love and research it took to develop it. I highly suggest looking into Itty Bitty Bookworm for your toddler or preschooler. The sooner they learn to enjoy literature the sooner they will bloom!